I love this comforter. I get lots of compliments on it. It is being used in my guest bedroom. The colors are very pretty . This eight-piece comforter set is the perfect addition to any bedroom. Hypoallergenic and machine washable, this embroidered comforter set is ideal for people with allergies and easy to clean. This set includes two cushions and two bonus pillows to complete the look of your bed. The stuffing balls up badly when washed, and the thread used to embroider the set is left on top of the piece so it snaggs on everything. all in all I would not purchase it again. the pillows are just useless. this comforter set is great! We wanted a comforter set not hot but not cold. Pretty but not frilly. Rugged enough for pets and a vaccum ran over it! This one was perfect! Looks great too! Was looking for a rich looking black and white bead spread for one of our guest rooms and its perfect. It's not the greatest quality, but we have had two guests so far and they were more than happy with it! Beautiful color and love the different textures! Was surprised at how nice the set is. really makes my room look awesome/ elegant. The only thing I don't like about the pillow set is you can't get the white tags totally off without possibly cutting the fabric. have this issue with any pillows I have purchased so not unique to this item. I am very pleased. Size is perfect for a queen bed with enough overhang on sides and bottom. The comforter set itself is lovely however I'm disappointed that after washing the comforter according to its directions the black ran into the gray and white portions on the shams and comforter. Also one of the pillows have brown stains on them. If I did not have these problems I would have given it a four stars. The colors were accurate and the quality is great. The bed skirt may be a little flimsy but everything is great. I would like to mention that I am and American that resides is Thailand, where I had this product shipped. Overstock.com did an excellent job of securing a shipper and pre-paying the duty so they came through customs with no problem. It only took 12 days and the shipping cost were very reasonable. Since everything in Thailand cost five times what it does in the US, this was a real bargain. Stuffing floats around but overall nice comforter. Extra pillows were a bonus. While the pictures of this set look very attractive the quality is terrible. The "micro" fiber feels like very cheap lining fabric & I don't even know how to describe the poly filling. The comforter is a mess. The seaming was sewed in places to keep the filling in place but it looks terrible. Some of the color even bled during the wash process. Don't waste your money. 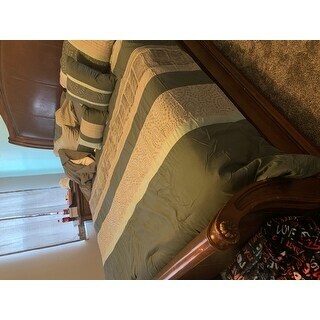 I purchased this comforter set t change the color of my master bedroom to an Aguascalientes and gray scheme. Very disappointed with the color. It is green not blue. I have slready purchased sheets and towels in an aqua shade and the colors are way off. I will be sending this back. Very nice comforter for the price! I liked it so much, I ordered the same comforter but yellow/gray color for my spare bedroom. Its very warm. I wasn't expecting too much for the price I paid but I was pleasantly surprised. The comforter set is lightweight which works well for the hotter months, the colors are vivid and it is well constructed. I am a satisfied customer. Waited for 5 months for this product it was on back order.. love it ! Its heavy enough just how i lioe it there were alot of lose strings when we took it out of the package but once we tk it off it looks great ! The picture was different shades of Grey with a light bluish color but the one I received has teal where the dark grey is. It’s pretty but not what I ordered. Love this bed set. It looks fantastic in the spare bedroom. We have had it for a few years now and it has held up very well. Love the extra pillows it comes with! This is a very attractive and well-made comforter set. My daughter loves sleeping under it, and it coordinates with her room beautifully. Pretty comforter set. Was not the softest so I only kept it for about a year. It washed well (which I always worry about). I hesitated on this after reading the reviews. I bought it for a gift because of the colors. It really is very nice, looks really pretty on the bed. The only reason I gave it 4 stars is because the color of the blue part is more of a greenish blue. It's still pretty but if your looking for blue, it's not. Unfortunately the description does not match the product. Description says it is gray and blue it most definitely is not blue it’s green and the “gray” is not a true gray more of a brownish gray almost taupe. Didn’t even take it out of the bag so I can’t comment on quality. Very disappointing annnnndd had to pay shipping to send it back which is not right since the description was wrong. I wasn’t sending it back because I ordered the wrong item, it was sent back because THEY said it was blue and it’s really green. The color is not blue; it’s very much green. The comforter is thin and not the greatest of quality. The stitching on the comforter is also poor. I doubt it will last longer than a few months. "Is the color aqua/teal or blue?" 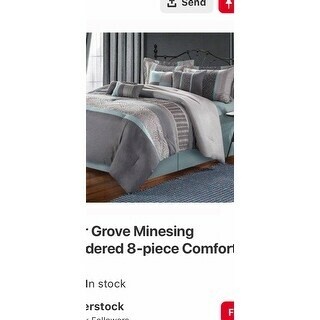 "Are the matching sheets in the blue color sold on overstock as well?" "when will you have more of the black in queen?" Hello 99jules, items are restocked as they become available; however, we cannot guarantee an item will be restocked. Thank you for shopping with us. "Will you get any more of the gray/aqua in?" Hello mto330, items are restocked as they become available; however we cannot guarantee an item will be restocked. Thank you for shopping with us! l.b. "Is the black one out of stock? If so, will it be restocked soon? Thanks!" Hello jayjay33, the black/grey option for this product is available in king and queen size. We hope this information is helpful. Thank you for shopping with us and have a wonderful day! "Do you sell the exact blue sheets shown in the picture? I'd like the matching blue sheets but want them to match the bedskirt. Thank you!" We have the Hemstitch 400 Thread Count Sateen Cotton Sheet Set, item 11402894. I don't know that they are the same sheets, but they would certainly work. Thank you.